A closer look at Auction Lot 3, kindly donated by Alpina we have the ladies Alpina Heated Boots. Ladies Trapper Heat model blends the pedigree of a hill boot with market-leading Heat technology for year round use and comfort. Market first. Alpina’s unique patented heating system. Proven technology. First used in Alpina’s downhill and back-country ski boot range. Proven product. 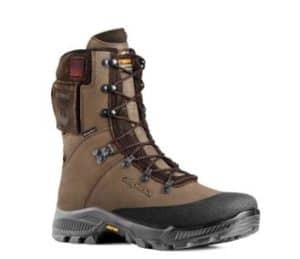 Available in three models of hill boot. Each boot has a battery in the cuff. Plug the charger in to the battery jack on each boot and leave to charge. (The charger flashes with a green light while charging is in progress). Press the square InTemp button at the top of the boot. The red flashing light on the side of the boot shows it is warming up. Adjust warmth as required. The front toe cap and mid-point of the foot warm up. Natural blood flow moves the warmth down the length of the wearer’s foot. It takes 30 minutes to fully charge both boots. Easily done at home or in the car or truck. Available through Alpina Authorised Retailers from September 1, 2018 onwards. Please ring advance to check stock levels. North Allerton Shooting Supplies, Thirsk. James Crockart & Son, Blairgowrie. The batteries and charger plus UK adaptor are sold with the boots. Single replacement batteries will also be available. Charged from a wall socket or in-car charger. Laces: Mountaineer grade. Length 200 cm. Size run: UK 2.5- 8. Boots have removable inner sole unit under the foot-bed to fit a half size larger. For example a UK 6 will also fit a UK 6.5.